If you don’t know what the feature “Multiple accounts” is, on Instagram, this title may be a little misleading. However, don’t worry. In this article, I’ll both talk about how you can add multiple accounts on Instagram, but also how your job with managing several Instagram can be made more effective. When Instagram’s “Multiple accounts” feature was released, I jumped of happiness, because the problem it was now solving had been a huge pain point for me for many years. At the time, I was managing around 5 accounts, and it was a huge pain point having to log in and out of each and every account, I managed when I wanted to check notifications, check messages, or make a post. But did I become an expert at remembering passwords? You betcha! In this article, we’re looking at (the amazing) Instagram feature called “Multiple accounts”, how you can use it, and how you can make your life as a multiple-account managing individual less stressful. What is the multiple accounts feature? 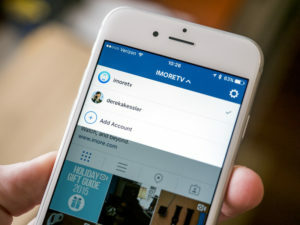 The multiple accounts feature basically means that you are able to be logged in to up to 5 Instagram accounts at once. Before the update, those who managed several accounts had a huge struggle. Some bought one device for each Instagram account they managed because it was so time-consuming and annoying to log in and out of every account. Others manually logged in and out every time they were going to do something on one of their accounts, and as someone who did this for several years, I can say that it was a real pain. Some people decided to use sketchy third-party apps, and those who chose the unsafe ones, unfortunately, had their accounts hacked. First off, since you were logged out, you did not receive any notifications, except from the account you were logged in to – leading to you missing a ton of important messages. Second, because it was so exhausting to log in and out all the time, and jump between accounts, you wanted to do it as little as possible, leading to overall worse results on the page. Lastly, when I was among a lot of people and had to log in to my account, trying to hide my login and password was a real challenge. And trying to type it in discretely, I looked like a real idiot. But luckily, mine, as well as a ton of other people’s savior came. Instagram listened to our prayers and introduced the Multiple accounts feature. The feature allows you to add up to 5 accounts at once, meaning you are logged in to 5 accounts at once that you can switch between in a matter of seconds. This is an important step for Instagram, because it shows that Instagram encourages multiple-accounts use. And more importantly, they acknowledged that there were so many people who had several accounts. Adding accounts is super easy. Just remember that you cannot add more than 5 accounts. Make sure you’ve updated to the latest version of Instagram (all accounts should have the feature by now unless you haven’t updated the app for a long time). Go to your profile and tap on the gear icon located to the right in your profile. Scroll down to the very bottom until you see “Add account”. Tap it. Now, you’ll be presented with the exact same interface as when you log in to your Instagram account. Type in the login info for the account you wish to log in to and tap login. Now, you have added that account. 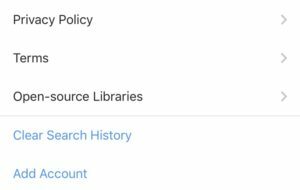 Switching between the accounts you are logged in to is extremely easy. To switch between accounts, tap on your profile picture at the bottom right corner of your screen. This will take you to the profile of the account you are currently logged in to. Now, tap on your username at the top of your screen in the middle. Here, you’ll see your username and an arrow pointing down. Remember that if you are only logged in to one account, you won’t have any possibility of switching between accounts because of the simple reason that you have no accounts to switch between. If you are logged in to several accounts, you can tap on the mentioned “button” and you will be presented with a drop-down menu showing you all the accounts you are logged in to. Tap on the account you wish to access. If you are logged in to multiple accounts and want to log out from one, you can do so very easily. 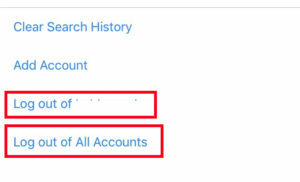 Logging out from an account and removing it from your “multiple accounts” is especially helpful if you want to give room for a new account when you’ve reached your limit of 5 accounts. To remove an Instagram account, go to your profile and tap the cog-wheel in your profile. Just like when you add your first account, scroll down to the bottom of the page until you see blue text. Here, you have two options. Either you can tap on “Log out of yourusername” which logs you out from the account you are currently logged in to. If the account you are logged in to is not the one you wish to log out from, switch it and then proceed with the same process. The second option you have is to “Log out of all accounts”. This is especially helpful if you are logged in to many accounts but don’t want to log out from the one by one. By selecting that option, you can log out from all your accounts with ease. Notifications work just like they do when you are logged in to one account. This means that if you have your notifications completely turned on for all the accounts you are logged in to, you won’t receive any notifications. If you, on the other hand, have all notifications activated for all the accounts you are logged in to, you will get notifications from all of them. If you quickly want to see how many notifications you have for each account you are logged in to, tap on your username at the top of the screen that shows you all the accounts you are logged in to. Next to each username, a number will be presented. This number tells you how many notifications you have got for that particular account. 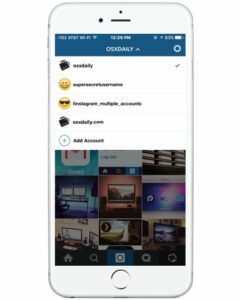 The multiple accounts feature is an Instagram update that has been met almost solely with cheers and praises. It’s an update that a lot of people can make use of since it is common to have more than on Instagram account. The update makes first and foremost social media managers’ life a lot easier, but also regular people using Instagram purely for entertainment. If you had multiple accounts before the update, you know how much time and energy this update saves you. Tack för detta tips! Nu hoppar jag lättare mellan mitt privata och mitt PRO-konto!